Publisher: Crown Publishing Group a division of Random House, Inc.
Summary (from Goodreads): At least one-third of the people we know are introverts. They are the ones who prefer listening to speaking, reading to partying; who innovate and create but dislike self-promotion; who favor working on their own over brainstorming in teams. Although they are often labeled "quiet," it is to introverts that we owe many of the great contributions to society--from van Gogh’s sunflowers to the invention of the personal computer. Passionately argued, impressively researched, and filled with indelible stories of real people, Quiet shows how dramatically we undervalue introverts, and how much we lose in doing so. Taking the reader on a journey from Dale Carnegie’s birthplace to Harvard Business School, from a Tony Robbins seminar to an evangelical mega church, Susan Cain charts the rise of the Extrovert Ideal in the twentieth century and explores its far-reaching effects. She talks to Asian-American students who feel alienated from the brash, backslapping atmosphere of American schools. She questions the dominant values of American business culture, where forced collaboration can stand in the way of innovation, and where the leadership potential of introverts is often overlooked. And she draws on cutting-edge research in psychology and neuroscience to reveal the surprising differences between extroverts and introverts. What I Loved: In reading Quiet it was reaffirmed for myself, yet again, that yes, I live up to that statistic. I am that 1 in 3 person, but I am not just a statistic. I am an introvert who prefers listening to speaking, and would gladly choose staying at home with a book in hand over of going to a crowded place out in public or to a friend's party. That said, I was really excited to hear that there was a book out there (Enter: Quiet) that doesn't gawk at my naturally quiet nature, or tell me that there's indeed something wrong with me because I am not super outgoing or utterly talkative. It was quite interesting to learn about how our country is run on the idealism that everyone should be more extroverted, especially in the work place; and it was also refreshing to read about the lives of different introverts, like Rosa Parks and Steve Wozniak, people similar to myself, who shaped our American (and sometimes non-American: think Ghandi) society/culture by being true to their naturally quiet selves. These soft-powered men and women were the ones who paved the way for us quiet ones. I really enjoyed reading through the Introduction and the sections on Collaboration, Soft Power, Communication and Cultivating Quiet Children. 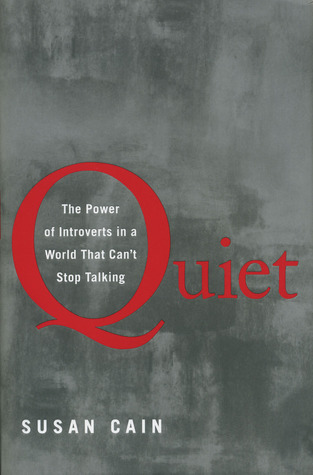 This book also debunks many myths about how introverts really operate. For example, introverts are not anti-social, they're not all shy and yes, though they sometimes come off as being extroverts they are usually just masquerading their innermost personality traits to make others, like their friends and coworkers, feel more at ease. Chances are there are introverts in your family, your workplace and in your Church. You just have to look hard enough to see them for who they really are: quiet, thoughtful, creatives, writers, scientists, poets, photographers, engineers, etc. This book was definitely not meant to be read by introverts alone. This book is for the extrovert and the extrovert-masquerading introvert who longs to be unleashed into the perfectly acceptable quiet life that they were born for. Also, though I knew that this book was not necessarily a Christian book when I first requested it, some unknowing readers might find it helpful to know that this book discusses sexuality and uses curse words on occasion, though neither subject matter was used in a vulgar manner. I'm Recommending This Book . . . If you are an introvert who wants to learn more about yourself and your personality, or if you are a curious extrovert who wonders why your friend Sally would rather stay at home on a Friday night after work and read her book than come to your super-fun friend-filled parties, then this book is for you. You will learn how valuable both introverts and extroverts are; and hopefully you will find your place along the way. About The Author: Susan Cain's writing has appeared in the New York Times; the Dallas Morning News; O, The Oprah Magazine; Time.com; and PsychologyToday.com, and her TED talk has been viewed more that three million times. She lives in the Hudson River Valley with her husband and two sons.